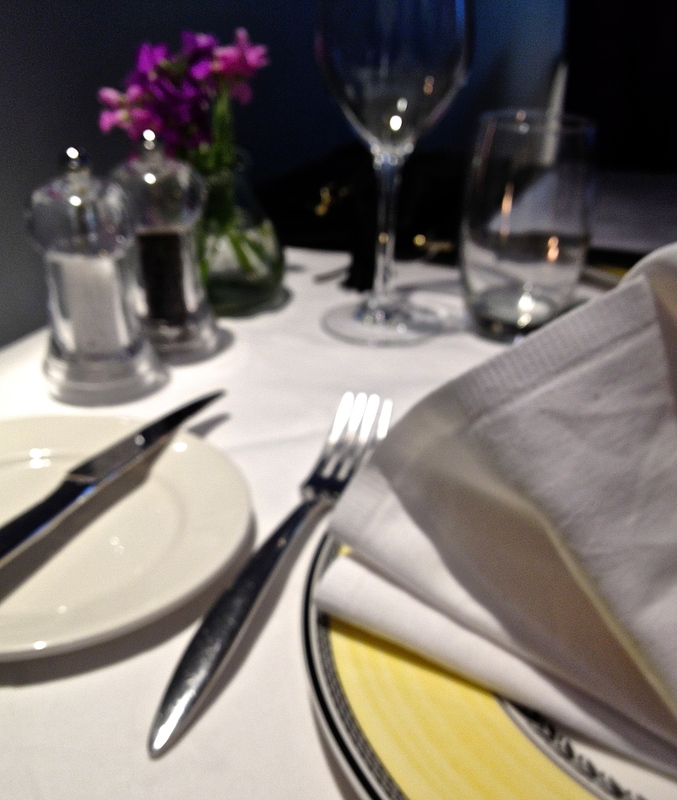 Finn’s table is a restaurant in Kinsale, a lovely historic port just a short drive from Cork. The restaurant had only opened about three months prior to our June visit and is run by a husband and wife team that formally had a restaurant in Timoleague (go there for the ruined Abbey). To see more details of the restaurant you can visit their website by clicking Finn’s Table, while further commentary and photos are provided below. I would like to underline that this review was based on a visit at the end of June 2013 and I have no connection whatsoever with this establishment. The Restaurant was chosen for a special occasion and based on a review spotted in the Irish Examiner newspaper. The restaurant is relaxed and seem to suit the 25+ type of market. We were sat at a corner-table which was fine, but a pillar did provide a few difficulties for the waiting staff when serving food. 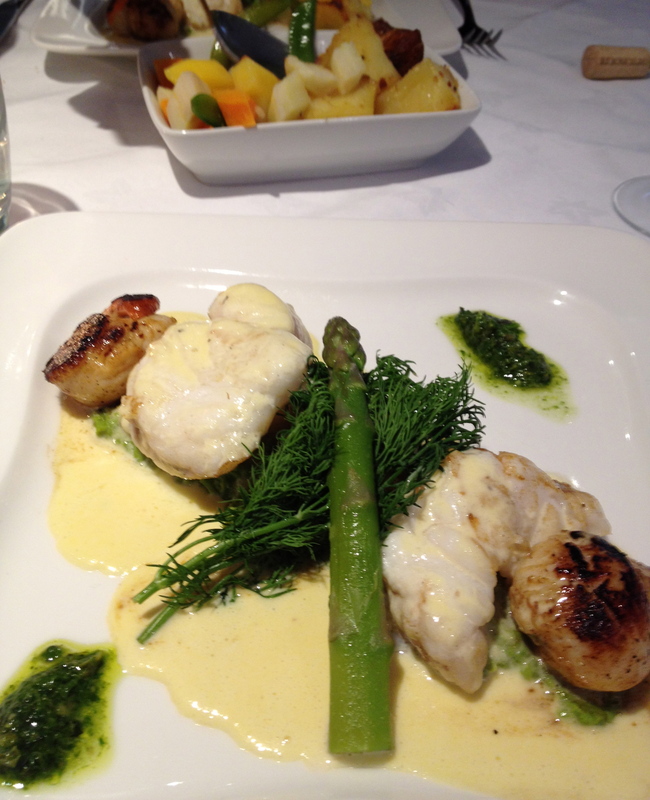 I would normally choose my main course first and opted for the ‘Monkfish Medallions with Scallops’, as did my wife. It was then I got into a little bit of difficulty as so many of the starters were fish or seafood (though I note this is the same as the starter menu provided on its website). In the end I chose a Pea, Spinach & Mint Soup. The first bit of food that arrived were a couple of tasters of salmon with cream cheese and chives that were quite straightforward and delicious (I was doubly glad that I had opted for the soup when seeing these arrive). 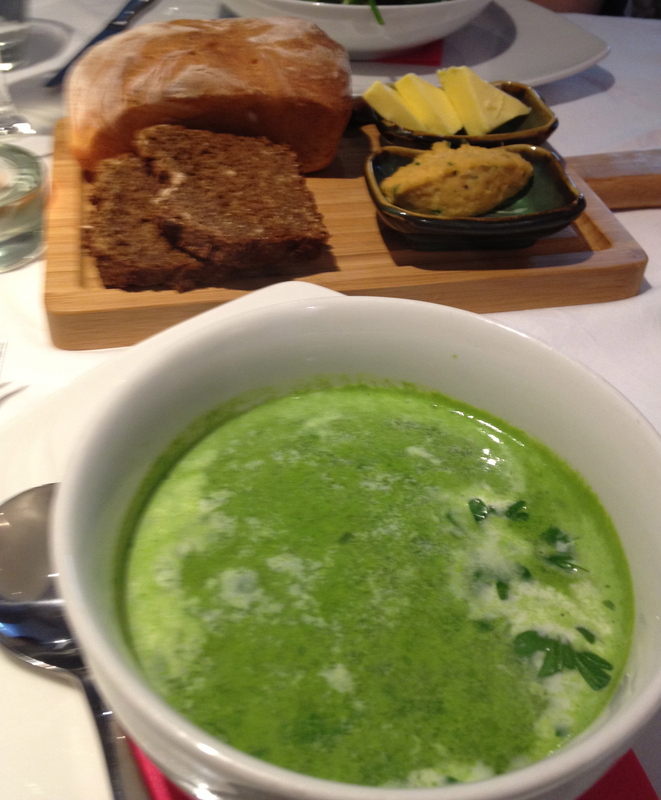 The soup itself tasted very fresh and was perfect for the summer’s evening that we were enjoying while the Wife really enjoyed her Goat’s cheese salad starter. A good start. Then came the monkfish in a cream sauce which was nicely presented and came with a separate bowl of root vegetable. Again we agreed it was excellent. To finish we had coffees and a Dessert selection plate (including home-made ice-cream,chocolate mousse and lemon tart). I thought these were good, but the selection would not have been my wife’s choosing. At the end of it all, after the meal the air was still balmy so a walk around Kinsale and its marina completed the rather enjoyable evening. The food we chose was relatively light and full of flavours, without any one being overpowering. We both look forward to a return at some point for a further celebration.